Our team of teachers at The Dance Station are well known Dance Persona who are dedicated, passionate and have their lives revolve around Dance. Ms Rosalind Ong graduated from the University of Singapore with a BA (English Literature and Philosophy) and from the Royal Academy of Dance (RAD) in London where she earned the following qualifications: Licentiate of the Royal Academy of Dance, Associate of the Royal Academy of Dance and Associate of The Imperial Society of Teachers of Dancing (Awarded with Distinction). At the RAD, she studied ballet and dance under Alan Hooper, Andrew Hardie, Debra Wayne, June Mitchell, Keith Lester and Maria Fay. Her lecturers included distinguished figures such as Ann Hutchinson Guest and Clement Crisp. As a professional dancer, Rosalind has danced in pieces by distinguished choreographers such as Goh Soo Khim (“Temple Tone Poem”, “Paquita” and “Rapturous Rapport”), Yosuhiro Okamoto (“Disjointed Twins”) and in Lim Fei Shen’s much-acclaimed piece, “Quartet”. Upon return to Singapore from the RAD, Ms Ong began her teaching career, assuming positions at the Yamaha School as Head of Dance, the Peoples’ Association Dance Company as Ballet Mistress and Choreographer, and at the British Association of Singapore. For a period of time, she also served as Principal Teacher at the Jean M Wong School of Ballet in Hong Kong, where her works “Tango…in Contemplation” and “Chorus Line” were widely acclaimed by the South China Morning Post, which wrote: “…[the] choreography, costuming and lighting made this not just a kid’s show, but a wonderful potpourri of music and dance styles’. Her other choreographies, “Bach goes to Town … in Dance” and “Parody of Dance”, were chosen to be featured at the Singapore Festival of Dance in 1983 and 1985 respectively where they were well-received. Some of her other pieces – “You Raise Me Up”, “Dance with Me”, “The Four Moons”, “The Lord’s Prayer”, “Tango” have been performed widely. Ms Ong’s students have been showcased on various platforms. Locally, they have been featured in President’s Challenge Dance-a-thon, the prestigious Bonae Voluntatis Gala and the Singapore Arts Festival. 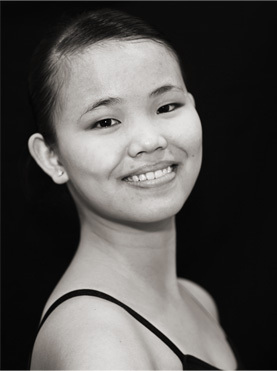 In 1996, several of her students who participated in the RAD Summer School were selected for the OKH Dance Scholarship, with Stephany Aw clinching the “Most Potential Student” award. In Dec 2006, she brought her students to perform in Melbourne …. .Most recently in 2009, her students performed at the Gala Dance and Competition, staged to raise funds for the prestigious Genee Awards, held in Singapore September 2009 and the Global Day of Prayer in June 2011. Presently, Ms Ong spends time grooming the next generation of potential talents at her ballet school, The Dance Station. She is also an official Tutor and Supervisor to trainee teachers in the region taking the RAD Certificate in Ballet Teaching Studies (CBTS) for the Royal Academy of Dance. Miss Sim has been training with Ms Rosalind Ong since the age of 5. Throughout her RAD exams she has scored Distinction for all her Graded syllabi, Intermediate Foundation and Intermediate, and a Merit for her Advanced 1. She has also completed her Advanced 2 with Distinction. She has also many years of performing experience having taken part in the prestigious Adellin Genee Fundraising Gala performance, Global Day of Prayer and RAD Summer Schools. A graduate of Nanyang Academy of Fine Arts (NAFA). Miss Lee graduated in 2012 and won the acclaimed “Best Graduate Award” and the Ngee Ann Kongsi Merit Award consecutively in 2010 and 2011. She attained both her Intermediate and Advanced 1 RAD Vocational Exams with Distinction. She is an experienced teacher in Classical Ballet as well as Contemporary and Jazz. Her work has won top award in the Prague International Dance Competition in 2018. Miss Joanne holds a Bachelor in Economics and Finance, Diploma in Dance as well as Management Studies. She obtained her RAD Advanced Foundation and has many years of experience in performance, teaching and production. She is a well liked teacher and is actively involved in Church production.